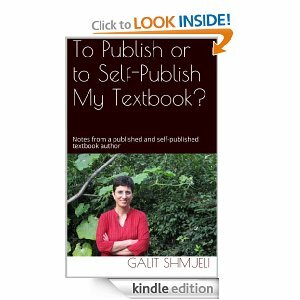 New short guide: "To Publish or To Self-Publish My Textbook?" My self-publishing endeavors have led to a growing number of conversations with colleagues, friends, colleagues-of-friends and other permutations who've asked me to share my experiences. Finally, I decided to write down a short guide, which is now available as a Kindle eBook. To Publish or To Self-Publish My Textbook? Notes from a Published and Self-Published Author gives a glimpse into the expectations, challenges, rewards, and surprises that an author experiences when publishing and/or self-publishing a textbook. This is not a guide on self-publishing, but rather notes about the process of publishing a textbook with a big publisher vs. self-publishing and what to expect. To celebrate the launch, the eBook is FREE for 72 hours. Post the promotion it will still be cheaper than a cappuccino. You can read the book (and any other Kindle book) on many devices -- no need for a Kindle device. You can use the Kindle Cloud Reader for online reading, or else download the free Kindle reading app for PC, iPad, Android, etc.